Description:The value of living healthily is indisputable, but what exactly can we do in our daily lives to be our healthiest self? In his new book, Bryce Wylde sets out to answer that question. He sorts out the confusing terminology used to describe natural medicine and leads us through a process of discovery about our own real state of health by showing how state-of-the-art self-testing now permits us to properly assess where we're vulnerable and where we're not. Whether you are worried about a vitamin deficiency or wonder if you're lacking the "feel good" brain hormone serotonin — or even if you just want to ensure you're not wasting your money on supplements — you'll learn what simple steps to take to test yourself. Wylde surveys and individually rates an array of present-day natural remedies from a no-nonsense, evidence-based perspective. He takes us on a guided tour of today's hottest health trends, highlighting what is good and steering us away from what is dubious (or outright snake oil). 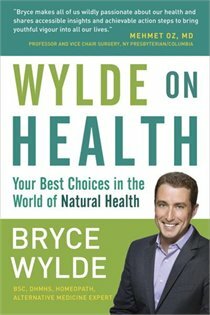 Underlying Wylde's ratings is the very latest research — and he makes it clear that in the face of the astronomical rise in disease and the ubiquity of nutrient-devoid foods, we have no choice but to supplement our diets with vitamins, minerals and antioxidants if we want to live to our fullest potential. Finally, Wylde on Health explores how we will increasingly use the strategic supplementation he recommends to redress genetic predispositions — the future of preventative health care. "We share the conviction that the future of health care must and will be a thoughtful integration of evidence-based Western medicine with CAM practices, which are also increasingly evidence-based, and are very often founded on thousands of years of human use. We also concur that health is best achieved when patients' care is personalized and they are active participants in it." "My primary motive is to empower consumers to make appropriate educated choices in the realm of natural and complementary alternative choices that are often found over the counter at your local pharmacy or health food store." "The standard medical model, as widely practiced, rarely takes into account the unique genetic makeup of each individual, exposures to environmental toxins and the aspects of today's lifestyle that have a direct influence on how healthy we are. In other words, the current health care model fails to confront any semblance of cause and solutions when it comes to chronic disease."